Fundraising continues to launch study to revise poultry publication. 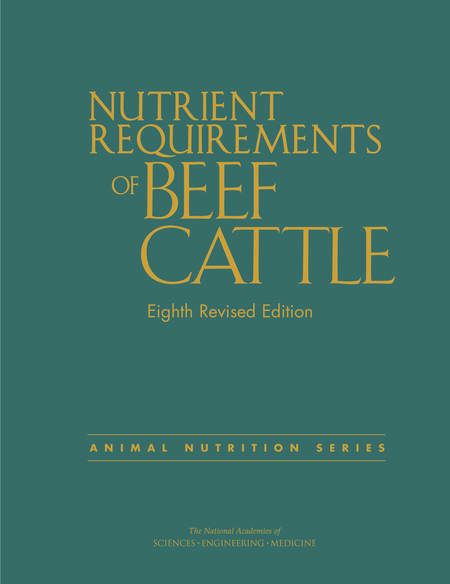 The Institute for Feed Education & Research (IFEEDER) recently announced its support of the newly released Nutrient Requirements of Beef Cattle: Eighth Revised Edition (Beef NRC) publication. IFEEDER largely funded the revision, donating $75,000 to the National Academies of Sciences. The Beef NRC, originally published in 1944, serves as a reference to animal nutritionists, professors and the cattle and feed industries in the development and implementation of nutritional and feeding programs for beef cattle. Since the seventh edition revision in 2000, the industry has undergone tremendous change, initiating the need for an eighth edition. "Since the last Beef NRC edition, the industry requirements have seen quite a bit of change, and many of the recommendations are obsolete," IFEEDER secretary Richard Sellers said. "The eighth edition offers updated research -- conducted throughout a span of 14 years -- and new information, which IFEEDER believes is vital to share with industry." Potential research areas for the future. A symposium on the publication will take place July 21 at the 2016 Joint Annual Meeting in Salt Lake City, Utah. IFEEDER was created by the American Feed Industry Assn. in 2009 to support the future of the feed industry as it is challenged to sustain the escalating world population. The IFEEDER foundation broadly represents the feed industry, including representation from academia and experts in science and technology. The Board on Agriculture & Natural Resources (BANR), part of the National Academies of Science, is seeking $100,000 in non-corporate funds to complete its fundraising to launch a study to revise the "Nutrient Requirements of Poultry," which the National Research Council last updated in 1994. BANR said the report contains information that is fundamental to animal health and to the economic efficiency and environmental sustainability of poultry production. Companies in the feed ingredient and genetics industries have offered generous support that will be matched, in part, by commitments from the United Soybean Board and the IFEEDER foundation. However, the Academies mandates that no more than 49% of the total cost of the study be covered by corporate funds, so BANR is looking for poultry producers, poultry associations, public agencies, commodity checkoff boards and foundations with whom to partner to complete the fundraising on the 51% side of the ledger. BANR is seeking ideas on eligible organizations who may wish to be among the sponsors of what will likely be one of the most internationally read (and used) reports coming out of the Academies. BANR can be contacted at banr@nas.edu.